On the occasion of International Women's Day 2019 on 8 March, the Sexual and Gender-Based Violence (SGBV) Working Group, which is co-led by UNFPA and UNHCR and comprised of more than 40 national and international organizations, has decided to pay tribute to the Jordanian and refugee women and girls who are building an equal future for all in Jordan. The SGBV Working Group has selected 9 stories showcasing inspiring women and girls who are innovating for change. Despite facing many challenges, this group of trailblazers have found creative ways to empower themselves and support their families and communities. Since she was a child, Areej wanted to have her own mushroom farm. She would spend many afternoons planning for her farm down to the smallest details, but she was struggling to find ways to start it on her own. Areej was beginning to lose hope until she was invited to participate in a session on women’s economic empowerment organized by Alianza por la Solidaridad in her hometown of Irbid. During the session, the organization encouraged the women to discuss their dreams. Thankfully, she came prepared, bringing with her ideas for the mushroom farm’s budget and marketing. A week later, she received a phone call: Alianza wanted to support her project. With the organization’s financial and technical support, Areej was able to start the farm with five other women in September 2017, and they’ve since been harvesting regularly. You can now find their mushrooms being sold at local supermarkets. “I’ve learned to believe in myself and trust my abilities,” says Areej. Until recently, *Hanan's life was marked by domestic violence, first, at the hands of her father, and, later, her husband. Five years into the Syrian war, she and her family fled their hometown and, eventually, settled in Azraq refugee camp. 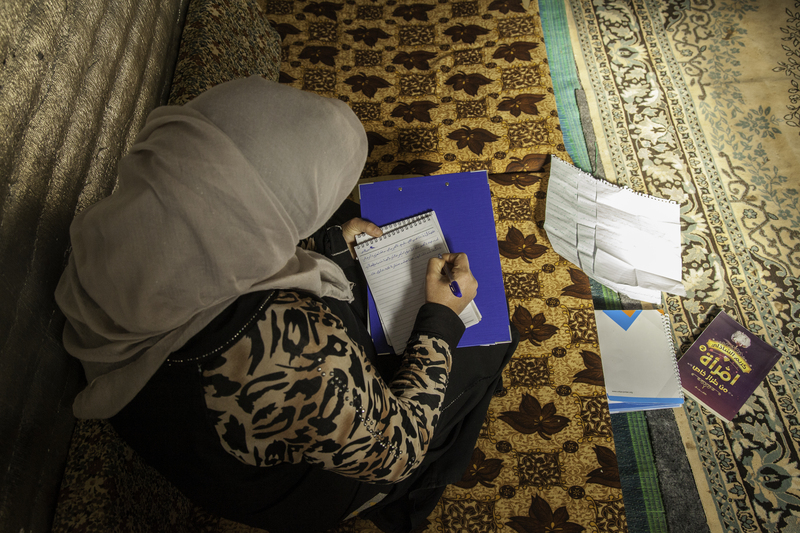 Hanan remained closed to the outside world until she met Dina, an International Rescue Committee counselor working in Azraq with the UNFPA-supported women's protection and empowerment program. Dina helped her identity ways to remain safe at home, report abuse and take legal action. Dina also encouraged Hanan to write as a form of therapy, which Hanan enjoyed so much that she decided to turn her life story into a book. She recently finished her book and is now looking for opportunities to publish it globally in order to share her story with women and girls who are facing violence. "I wrote this book because I wanted to encourage women who are experiencing violence to seek help," says Hanan. When Manal's family went into debt, she knew she had to take matters into her own hands. So, in 2018, she enrolled in beautician and project management courses provided by the Jordanian National Forum for Women in partnership with UN Women. In the beginning, Manal was scared to even touch a client's hair, but those fears were soon overcome. It didn't take long before she became a passionate student of cosmetology and hairstyling. Once she felt confident with her new beauty and project management skills, she decided to open a salon in her home. Now, Manal is the enthusiastic owner of a thriving home-based business in Amman, with regular clients who travel far distances. She also provides free hairstyling and makeup courses to women in need. "My life is finally filled with positivity," says Manal. "I can pay for my children's education, pay off my debts and I no longer rely on my husband for support." Maha, 17, is an adolescent girl who lives in Zaatari refugee camp with her family. Due to instability caused by the war and a disability that made it difficult for her to adapt to camp conditions, she had to drop out of school for almost a year. Eventually, she found the will to re-enter the 11th grade, but the gap in education made catching up in school a challenge for her. Maha found the support she needed when she began attending a remedial education program run by Relief International. While the program has helped her by providing personal interaction with teachers and many useful resources, it was she who took the initiative to find innovative ways to overcome her difficulty using her hands. For example, she takes photos of the teachers’ lessons instead of writing them down by hand. Maha now encourages students facing similar situations to continue their education despite the obstacles: “Adapt yourself to the conditions; don’t wait for the conditions to adapt to you,” she says. After Umm Samer’s husband became ill, her family struggled to make ends meet. Not sure where else to turn, she visited the Arab Women’s Organization (AWO) and soon became a regular visitor, attending awareness sessions and vocational trainings. In one of the trainings, Umm Samer learned about handicrafts, and she decided to take some materials home with her in order to practice her new skill. When she went back to AWO a short time later, she brought with her several handmade products, such as trays, mirrors, tables and baskets. Her trainer, thrilled by what he saw, advised her to sell her products. Eventually, AWO helped Umm Samer participate in an exhibition at a local university, which gave her the opportunity to network and market her products in the local market. And, as they say, the rest is history. She now makes enough money from handicrafts to be able to support her family. “Working has made me stronger. It’s not something to feel ashamed of,” says Umm Samer. After fleeing to Jordan from Syria in 2014, Lina began to feel depressed due to the psychological stresses she had faced during the war. She was also struggling to cope with the severe pain being caused by her rheumatoid arthritis. One day, a friend told Lina about a UNFPA-supported centre run by the Institute for Family Health, and she decided to make a visit. It didn’t take long before she was regularly visiting one of the centre’s psychologists and attending its awareness sessions on women’s empowerment. The sessions and psychosocial support inspired Lina to express her emotions through drawing, a talent she started honing in elementary school. At first, she would draw sad images, like a bird in a cage, but, as her confidence grew, she began drawing images of strong, empowered women. Ruba was living in an impoverished village in Ajloun as an unemployed graduate with a degree in chemical engineering when she heard about the nearby UNDP-funded Dar Nemeh project—an initiative by the Princess Taghrid Institute that enables local women to harvest, sell and distil native aromatic plants. The women work as cooks, craftswomen and, in the laboratory, as chemical engineers whose finished products include distilled water, oil extracts, oil diffusers and candles. After inquiring about the project, Ruba was eventually hired on as the lead chemical engineer in charge of the laboratory at large. With her help, the laboratory has been able to obtain accreditation from the Jordan Food and Drug Administration, which enables the women to sell their organic products both locally and abroad. Wi’am, 17, is one of nine adolescent girls in Zaatari refugee camp who are teaching their younger female peers about puberty by reading to them about the subject from an innovative new book that they helped to co-design, entitled Flowers Island. The initiative, which is part of the Mercy Corps-Girl Center’s program, WISE Girls, was the result of a human-centered design process with adolescent girls in the camp who expressed a desire to teach their younger counterparts about puberty through the medium of storytelling. While experts wrote the initial draft of the book, the adolescent girls have been encouraged to take ownership of it and make modifications to anything that they feel doesn’t accurately represent them. Wi’am’s copy of Flowers Island, for example, has some words that are crossed out and others that are moved from one sentence to another. “I used to be shy to talk to my mom about my period, but now I’m more open about these things and our relationship has gotten better,” says Wi’am. As a member of CARE Jordan's Women's Leadership Council, Rawaa, a Syrian refugee, works to eradicate gender-based violence, early marriage and discrimination against women and girls in her community by involving men and boys in the discussion. It's a forward-thinking approach that has proven to work, as she's convinced many families to allow their daughters to continue their education instead of getting married. But, despite Rawaa's success changing mindsets outside of her home, she was having a hard time doing the same inside of her home. Her husband wasn't happy with her new role because it required her to leave the house more than he liked. Thankfully, Rawaa was able to use the persuasion and debate skills that her community leadership role had helped her to develop in order to change her husband's mind. Now, you can even find her husband acting alongside her in plays showcasing the negative impacts of early marriage. "Empowered women go a long way if the want to!" exclaims Rawaa.